Five Finger Death Punch has already chosen a title for their new album which should be out this year. Jason Hook was interviewed by Eric Blair of "The Blairing Out With Eric Blair Show" at last month's NAMM show in Anaheim, California: "We do. But you're not gonna get it" he said about new CD title. "I have all these funny things I'm dying to say right now, but I'm not gonna say anything. 'Cause we've always thought about good joke titles, like Five Finger Death Punch 'Keep Your Receipt'. No... Or 'Not Our Best Work'. No... I can't tell you the title." Regarding whether there are any new Five Finger Death Punch songtitles he can share with fans, said: "Here's the interesting thing about that... In the phase that we're in now... This is interesting... Or at least I think it is... The phase we're in now, it's music tracks. So we kind of do... Ivan's sketching lyrics, but until they come together, we name them these arbitrary... anything, just so I can refer to it. So there's one that I just finished called 'Pulled Pork'. It won't be 'Pulled Pork' by the time it gets on there. [Laughs] By the time it gets to Active Rock radio, it will not be 'Pulled Pork'. But it's a contender for Active Rock radio, so we'll see what it's called by that time." 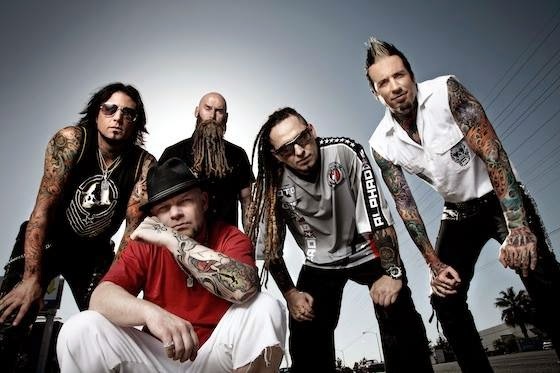 Hook also talked about a possible release date for Five Finger Death Punch's next album. He said: "Well, I know I have a deadline... I say 'I'... We have a deadline, and it's gonna be tight. But you know what?! Deadlines make for a focused work."